I happen to be a successful software developer, businessman, and entrepreneur. I’m no millionaire (yet), but by most measures I’m doing pretty well. I started my own business in November, 2007 with a single client and a single employee (me). It’s now 9 months later, and I have five people on staff and am seriously contemplating the purchase of another company that would result in a total combined staff of about 15. The whole time, the business has been profit-positive. So what is it that made me successful, not just in this latest business venture but across my career and life? There are a lot of little things: I strive for excellence in whatever I do. I’m always pushing myself to achieve more, grow more, learn more. I try to have a positive attitude (most of the time). I try to bridge knowledge and experience cross-discipline. But honestly, I think none of these things really makes a difference in the long-run because I constantly see people who have these things and more who are not as successful. Instead, what I see in every enduringly successful person is ethics. I always strive to do the ethical thing, and I know my staff does the same. I only hire people who have ethics, and I choose (as much as I’m able) to only work with people with ethics. Most of my friends and colleagues have ethics. Basic business ethics can be defined a hundred different ways, but I think of it as doing what’s morally right, what’s in the client’s best interests, and what’s in your staff’s best interests. 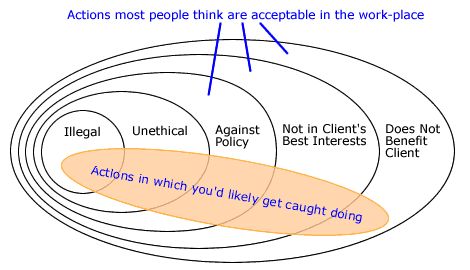 If any action violates any of those three spheres, it’s avoided. Seems simple, right? Seems like everybody would be doing this; but the sad truth is that so many people demonstrate such poor ethics that the few who do stand out like a flashlight across a dessert in the middle of a moonless midnight. Back in May, my family and I traveled to the Boston area, specifically Sandwich on Cape Cod, for a wedding. On the return, the flight had to make a bit of a detour around some weather, and this was to put us a few minutes late to the gate in Seattle. One of the flight attendants got on the radio to inform the passengers of the situation and note that there were six passengers who had connecting flights that departed within a few short minutes of our updated arrival estimate. The flight attendant asked that those who were not booked on one of these flights remain in our seats until the six could deplane. Some number of minutes went by, and as we were on our final decent into SeaTac airport, the flight attendant again came over the intercom and reminded us of the plight of the six. She then asked that those six signal their positions in the plane by pressing their call lights. Within a few seconds, five or so lights had turned on. Then about a minute later, the number had grown to about ten. A minute later, it exploded to nearly half the plane. It was simultaneously laughable and depressing. Everyone on the plane, those of us who didn’t signal and those who did, all knew that nearly half the plane were a bunch of unethical, selfish liars. But that didn’t seem to phase anybody. Nobody seemed embarrassed. Nobody switched off their call light. As the plane stopped at the gate, nearly every passenger sprung to his or her feet and into the isle, just as they would have had the fight attendant never said a word. A few of us stayed in our seats, marveling at what we saw. There was a lady a seat or two ahead of us who kept pleading with the people in front of her, “Please, I’m one of the six. My plane leaves in four minutes. Please let me by.” Not a single person even looked her in the eye. In business, I’ve noticed a set of five distinct stages of ethical erosion. There’s what’s illegal, what’s legal but unethical, ethical but against company policy, not against policy but not in the client’s best interests, and finally what’s not really contrary to the client’s best interests but isn’t really going to benefit them either. The sad fact is that most people think anything conducted in the last three bubbles is acceptable provided you don’t get caught. Here’s the thing, though. Over time, these things add up; not explicitly into a codified list, but implicitly, almost subconsciously in the minds of employers. An employer will likely never be able to pinpoint the problem but will instead talk about employee productivity or efficiency. Often, employees believe they should be compensated at or above what they’re worth to the company, because replacing them would cost the company more than what the company is currently paying them. But companies (with non-profits as the only exception) exist for the purpose of making profit. The only way a company can make profit is if it pays its employees a little less than what they’re worth. Think about it: If what you do for the company results in the company grossing an additional $50,000, the company cannot possibly pay you $50,000 and stay in business. The company can’t even pay you $50,000 minus tax implications and stay in business for long. The company has to pay you some amount a little under the value you bring to the company. And over time, that small discrepancy adds up to profits that can be invested back into the business, used to repay or fund dividends to investors, or spent in the form of bonuses and additional incentives and benefits to employees. Every time an employee does anything that falls into any of the above ovals, the company makes less profit, either in the short-term with things like stuff that’s not in the company’s best interests or long-term with things like unethical and illegal activities. Thing is, when you and your company act under a strict code of ethics, clients know this. They’ll see it right away. They see it because they see the contrast. There’s some sort of subconscious feeling that this person, employee, consultant, agency, company isn’t trying to cheat me out of anything; not going to steal or try to convince me to do something that’s not in my best interests. This employee isn’t out to do what’s best for himself to the exclusion of my business but is instead out to do what’s best for my business and thereby help himself more over the long-term as a result. Same goes for employers. Employers who treat their employees poorly tend to loose good employees. That results in turnover, which is expensive and inefficient. And that cuts into profits. Ethics matters more than talent and intelligence. Think about this: If you were going to hire landscapers to do some work on your yard, would you hire a company that you knew was unethical but had some very bright and skilled people on staff, or would you hire a company that was merely above average but had high integrity. Yeah. Me too. Next PostI’m Getting Old. Meh.